The book store shelves are filled with titles and authors we know little about. Adding to the confusion is the disappearance of familiar and trusted authors as well as the obvious change in the trustworthiness of publishers to offer orthodox material. Usually we have to choose a book by its title and take a chance on its contents. That was the case with this book by David Marshall. The subject announced by the title is of interest to me but I’ve never read Marshall. Typically, I found a mixed bag of agreement and disagreement. The book is basically an answer to Richard Dawkins, the most notable atheist of our time, as well as to Daniel Dennett and Sam Harris. 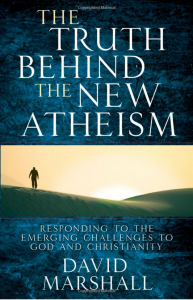 The first part of the book deals with origins and Marshall turns out to be a theistic evolutionist as opposed to Dawkins’ atheistic evolutionist. I had to push myself to finish the other 2/3 of the book. Things got better as Marshall began to answer the atheists who accuse Christianity of being a hateful religion and of being an “American Taliban.” Marshall has a lot of good historical material on how much Christianity has helped any country where it has gone. Unfortunately, Marshall makes no delineation between Catholic, Orthodox, or Evangelical, although he occasionally (predictably?) uses Fundamentalism in the usual caricatures. Still, underneath is a growing problem of aggressively marginalizing Christianity in this country as well as England. Marshall does set the historical record straight in helpful ways.